I’m sorry for this delayed announcement. There was an auction in progress for this error coin and I wanted to obtain a second specimen. The auction just ended this evening. A premature announcement would have drove up the final hammer price. In a nutshell this is an error coin that was struck in 1991 by the The Honolulu Mint. This error caught my eye after thoroughly checking out the images of an auction and looking for odd/peculiar traits. 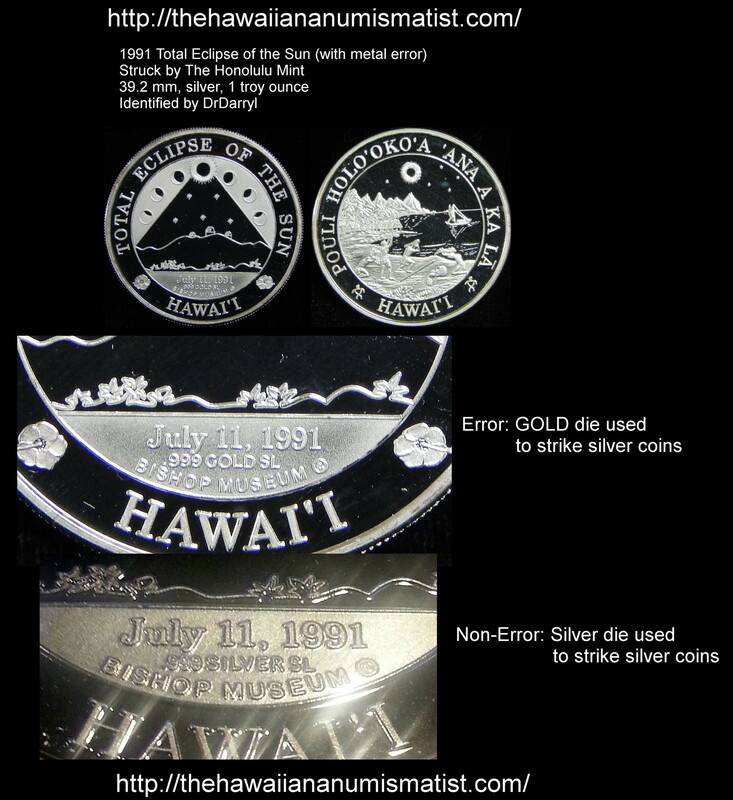 The Honolulu Mint incorrectly used its .999 GOLD obverse die in striking several silver 1991 Total Eclipse of the Sun coins. This is a significant error as the quality control of both The Honolulu Mint and Bishop Museum (ordered the coin to be struck) missed this error. This error may allow unscrupulous individuals to take advantage of the metal marking error. In this case, an unscrupulous individual can gold plate the error coin and sell it as a gold coin. My quick research indicates that the GOLD error occurred with coins having a COA starting at roughly serial number 2000. The current earliest known GOLD error serial number is 2023. A quick review of auction sales indicates that 1 out of 11 has the GOLD error (making this error hard to come by). Single click on the image to enlarge. Double click to super enlarge the image.The SL initial stands for Steven Lee, coin designer at The Honolulu Mint. Enjoy! And happy hunting for this newly identified error!